The aim of the industrial promotion program is to create new, powerful Polish brands, which will be recognizable in the world and will be associated with Poland. Polish entrepreneurs are ensured to receive up to 75 percent of qualified costs of partaking in foreign industrial fairs and commercial operations covered by this program. The industrial IT/ICT branch promotional program will be held between 26th April 2012 to 31st March 2015. Nastąpiła zmiana w kalendarzu wydarzeń BPP. Zamiast targów Intertelecom w Łodzi, planowanych na kwiecień, uczestnicy Programu wezmą udział w targach IT Future Expo w Warszawie. Targi odbęda się w dniach 10-11 czerwca 2014 na Stadionie Narodowym. Pomorska Agencja Rozwoju Regionalnego S.A. ogłasza konkurs dla małych i średnich przedsiębiorstw z województwa pomorskiego na udział w wyjazdowej misji gospodarczej do Szwecji z sektora ICT w terminie 1-4 kwietnia* 2014 r.
W pierwszych dniach lutego 2014 roku polscy przedsiebiorcy sektora IT odwiedzili w ramach misji gospodarczej i wyjazdowej Dolinę Krzemową. Dnia 12 lutego w Hotelu MDM przy Placu Konstytucji w Warszawie odbędzie się seminarium na temat: „Skuteczna ekspansja polskiej branży IT/ICT na rynkach zagranicznych”. Wszystkich chętnych serdecznie zapraszamy! 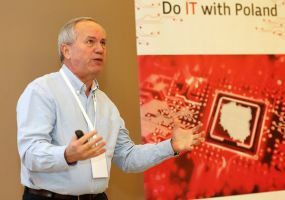 The Polish Ministry of Economy has stated, that as of July 2, the level of requested co-financing under the IT/ICT Branch Promotional Program exceeded 100% of the available allocation. International fair of innovation and new technologies, Inno-Tech Expo, will take place in Kielce on October 17-19, 2013. 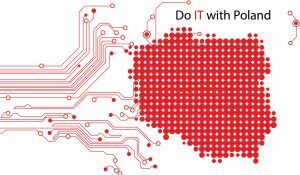 We kindly inform you that by order of the Polish Ministry of Economy, the deadline for submitting applications for participation in the IT/ICT Branch Promotional Program has been extended until October 31, 2013. The Polish Ministry of Economy has decided, that an entrepreneur participating in fairs under the IT/ICT Branch Promotional Program can choose an exhibition area of any size, not necessarily the previously obligatory 9m2. On September 24-26, 2013 an expert IT & Business fair under the banner “Where IT works” will be held in Stuttgart. 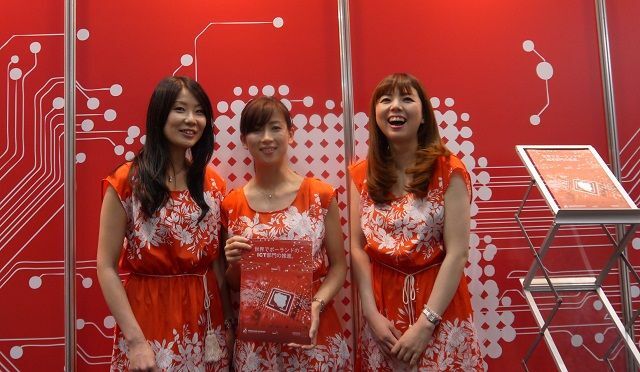 The company Velis from Krakow was one of the several Polish enterprises present at the Japan IT Week fair in Tokyo. The representatives of Velis consider their participation in the event as a very beneficial experience and count for beneficial relations with their newly established business contacts. 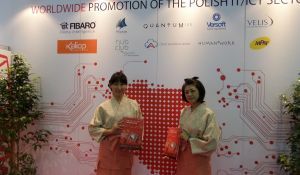 Polish entrepreneurs have just returned from Tokyo, where they participated in Japan IT Week – the largest fair in Japan, where newest technologies and IT solutions of different kind can be found. A field mission and an economic field mission took place alongside the fair. We kindly inform you that by order of the Polish Ministry of Economy, the minimum required number of promotional events under the IT/ICT Branch Promotional Program has been changed. The necessary requirement for receiving the financing is the declaration of participating in no less that 14 promotional activities, not 22 as previously. Media all over the world is publishing information about the dynamically developing Polish IT/ICT sector. The IT/ICT Branch Promotional Program was present at the 26th International Fair of Electronic Communications Intertelecom in Łódź. 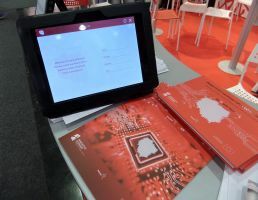 Between the 11th and 13th of April, the participants had the opportunity to get acquainted with the rules of the Branch Promotional Program and the offer of the Polish companies which exhibited their stands. Intertelecom is the biggest ICT fair in Poland. Numerous discussion panels and conferences accompanied this year’s edition of the fair. 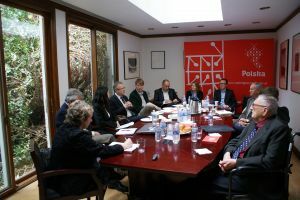 Representatives of foreign media came to visit Warsaw and Łódź in order to get acquainted with the quickly developing ICT sector. Please read the report from their visit. Polish entrepreneurs can submit their applications for co-financing for carrying out promotional activities on 5 promising foreign markets until June 30, 2013. The estimated amount of funds dedicated for this purpose is almost PLN 15 million. The remaining PLN 145 million is dedicated for the implementation of branch promotional programs. As much as PLN 160 million was allocated to the preparation of promotional materials, participation in fairs and conferences, etc. We have the pleasure to invite you to a conference entitled: “The export capabilities of the Polish IT/ICT branch on chosen foreign markets”, which will be held on April 11-12, 2013 as part of the Intertelecom fair in Łódź. 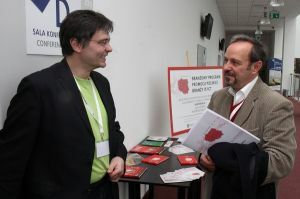 The conference is organized under the IT/ ICT Branch Promotional Program developed by the Polish Ministry of Economy. The participants of the conference will have the chance to learn about cooperation opportunities with companies from the IT/ICT sector in chosen countries, as well as share their experiences related with promoting and developing a company on various markets. 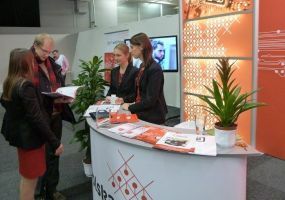 The biggest ICT fair in the world - the CeBIT fair - began today in Hanover. This year, Poland is the Partner Country at the fair which attracts hundreds of visitors annually. This event will be attended by over 150 Polish exhibitors and will be held on the area of over 3,000 square meters. The fair is accompanied by a number of smaller events and seminars. The IT INNOVATTIONS EXPO is the second fair, where booths of the IT/ICT Branch Promotional Program were present. Polish companies presented their products and services, and established new business contacts.Participation in the fair was a perfect opportunity to meet people from the industry and reach potential contractors. 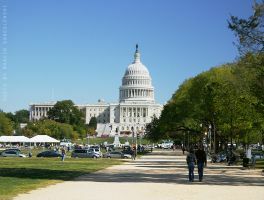 An economic field mission to New York under the IT/ICT Branch Promotional Program will take place on February 9-14, 2013. Polish entrepreneurs of the IT and ICT sectors will have the opportunity to meet with contractors and take part in a meeting with an IT expert from the USA, which will take place in the headquarters of the Trade and Investment Promotion Section. 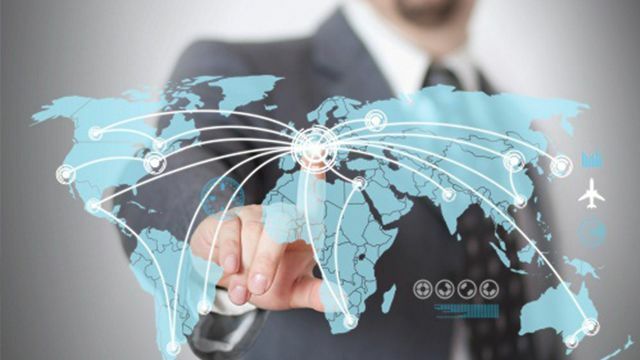 A seminar regarding "The export capabilities of the Polish IT/ICT branch on chosen foreign markets" will be held on January 31 (Thursday) at the MDM Hotel at Plac Konstytucji in Warsaw. Anyone interested is welcome to attend it. 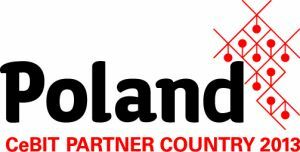 It is one of the most prestigious events of this kind in the world.In 2013 Poland is the Partner Country at the fair.It is a special opportunity for Polish companies to enter the German market and establish contacts with potential business partners from all over the world. As part of the Branch Promotional Program, Polish entrepreneurs from the IT/ICT sector will participate in the IT INNOVATIONS EXPO fair in Goteborg. 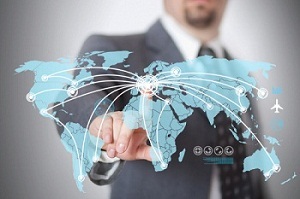 During the 2 days – January 22-23, 2013 – they will have the opportunity to exhibit their own products, present their services and meet with IT/ICT specialists. Participation in the fair is the perfect way to reach potential clients and establish business contacts. An economic mission to Norway took place on November 20-23. 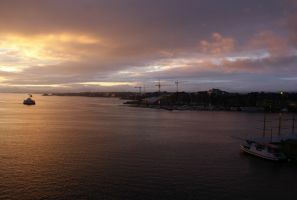 The mission location was Oslo, where most IT/ICT sector facilities are situated. 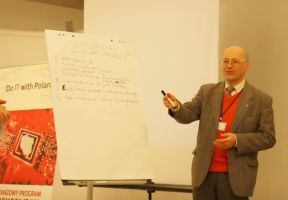 During the mission, a seminar was held in the headquarters of the Trade and Investment Promotion Section in Oslo (WPHI). At the seminar, presentations were made by WPHI representatives: Mr. Janusz Steć – Counselor and Chief of Section, Mariusz Biedrzycki – First Secretary and Ms. Kirsta Kierulf, Mr. Thor Beke and Ms. Aleksandra Eriksen from the Norwegian-Polish Chamber of Commerce. The participants of the mission did also have a possibility to take part in the CIO Forum conference, which took place on November 22 in the Oslo Kongressenter. This meeting allowed to establish contacts with IT entrepreneurs in Norway. 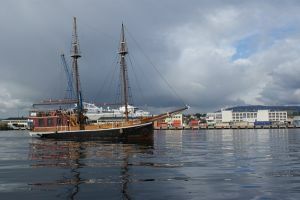 Within the mission, participants will take part in meetings with experts of the IT market in Norway and with business-related institutions, as well as have the opportunity to make business contacts. Should you be interested, feel free to contact us. We would like to inform companies interested in participating in the IT/ICT BPP that there is an instructional video regarding filling out the participation application form for this program. The video comprehensively presents the entire process of filling out individual entries in the form. The biggest IT fair in South America, which is also one of the biggest fairs in the worldorganized in that region, is now over. We were present there to promote the Polish IT/ICT sector and to make the investors attending this event more familiar with its characteristics. We would like to remind all companies interested in participating in the IT/ICT BPP that the first formal stage of entering the program is submitting the declaration to the executor. The declaration template can be found in the “Download” section. Click “more” to see the full article. We would like to invite anyone interested to participate in the Futurecom fair in Rio de Janeiro. It is one of the biggest events in the IT/ICT sector in the world. Every year the fair is visited by tens of thousands of guests – entrepreneurs and IT specialists. It is a perfect opportunity to make interesting business contacts, or obtain information regarding the growing IT market in Brazil. 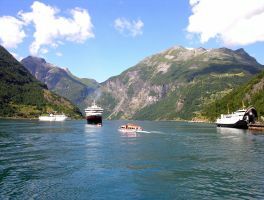 We would like to encourage you to get acquainted with the schedule for the economic missions to Norway, which will take place on September 18-19 2012. The file with the schedule can be found in the “About the program” tab, in the “Download” section. We would like to encourage you to get acquainted with the upcoming events within the Branch Promotion Program. The annual net income of Microsoft reached $17 billion. It is over $6 billion more than last year. According to the experts, the financial results of the concern were strongly influenced by the drop in sales of the Windows OS. However, there was an increase in, among others, inflows of the business solutions department. Anyone interested in seeing the video should email us. On July 16th 2012, another training organized by the Ministry of Economy took place. The receipt of applications for the Branch Promotional Program has already begun! 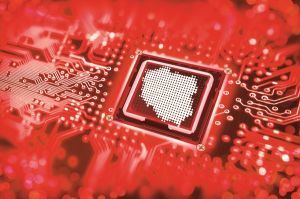 Even after the end of the European Soccer Championship, Poland will remain in the center of attention of the companies from the new technologies sector. 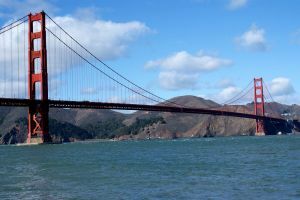 That is because in 2013 it will be the partner country of the BITKOM Federal Association for Information Technology, Telecommunications and New Media, as well as the CeBIT fair. There are new files available for download in the „About the program” tab. 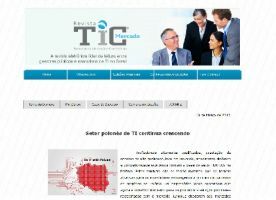 There are many publications about the industrial program of IT/ICT branch promotion in the Internet. The Department for the Implementation of Operational Programs of the Ministry of Economy would like to invite you to participate in a free training regarding the sub-measure 6.5.2 “Support for participation of entrepreneurs in promotional programs”.